The Maruti Swift is available as the Suzuki Swift abroad and is a popular choice of many customizers. The hatchback’s sporty design can easily carry off styling modifications. We have already seen many customized versions of this small car but this modified Suzuki Swift from Thailand is simply irresistible. 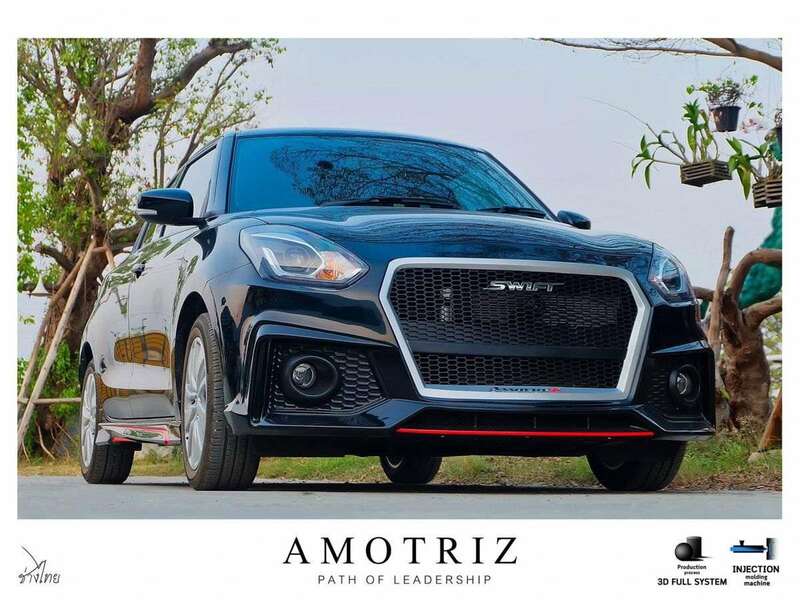 The modified Suzuki Swift comes with a body kit from Amotriz, a well-known customization shop in Thailand. At the front, it gets a new bumper along with a new grille. The honeycomb grille has ‘Swift’ badging and looks exactly like the grille of a modern Audi model. The new bumper gets a red-painted bumper diffuser and bold fog lamp enclosures that complete the Audi-like look. Even the side profile has not been left unchanged. It has sporty side skirts with red accents that match the front bumper lip. The stock alloy wheels have been carried over and feature the original tyres. At the rear, the modified Suzuki Swift gets a new bumper. It looks sportier and has a red lower lip and stylish dual exhaust ports to complement the sporty front bumper. 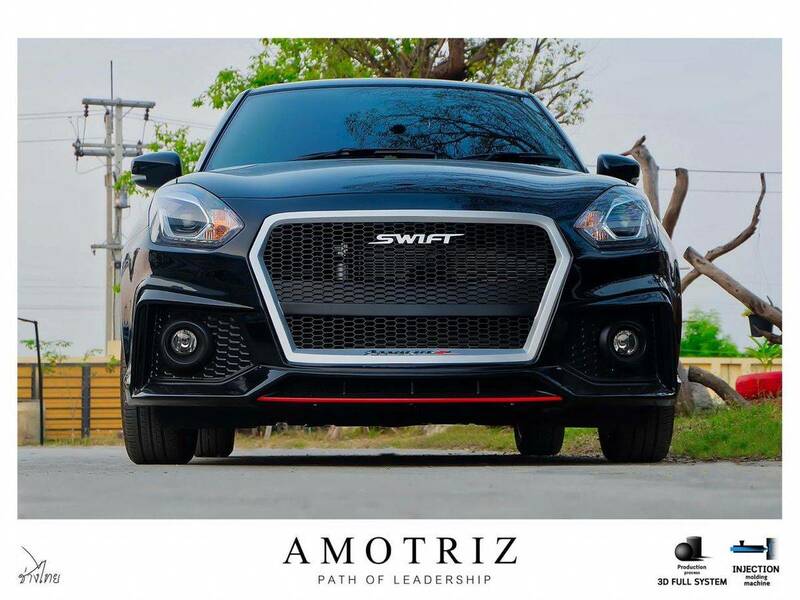 Other than the body kit from Amotiz, the Swift doesn’t get any other change. It retains the Super Black Pearl paint finish that looks pretty good on the hatchback. 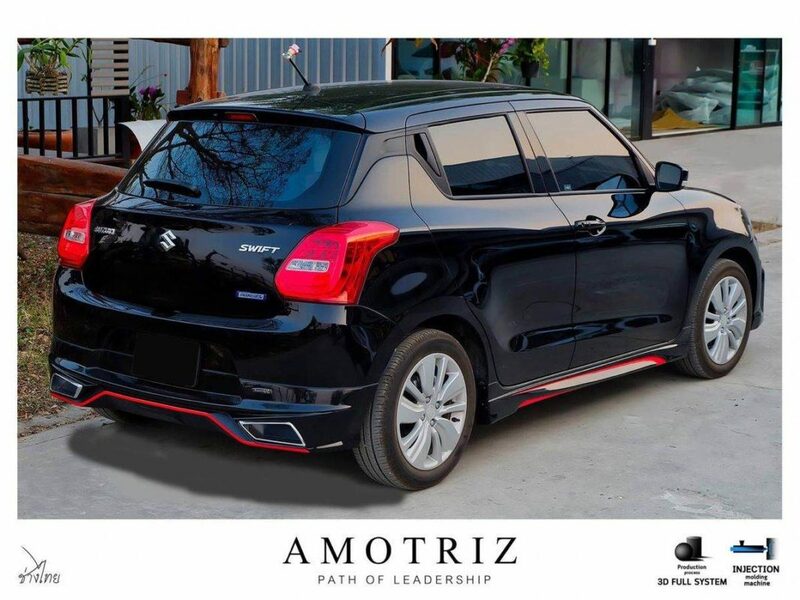 The modified Suzuki Swift doesn’t get any kind of performance modifications. Being a Thai-spec model, it is powered by a 1.2-litre Dualjet engine that produces 83 PS and 108 Nm. The engine comes mated to a CVT that sends power to the front wheels. In India, the Maruti Swift is available with two engine options – 1.2-litre petrol and 1.3-litre turbo diesel. The petrol motor of the Indian version produces 83 PS and 113 Nm. The diesel motor offers 75 PS and 190 Nm. Both the engines are mated to a five-speed manual transmission, with the petrol motor even offering a 5-speed AMT.